As any honest person who has one will tell you, dealing with phobias can be a time-consuming business. Not least because of the wide variety of objects, creatures and situations to which any fairly average human being is quite capable of developing an inexplicable and violent aversion. The range of such fears is not only vast, it is often quite bizarre. Needless to say, the person who is suffering from the aforementioned phobia invariably finds it less irrational than you or I might; and of course, documented research tells us that however bizarre that the fear of something may be, it is very real to the victim. Apart from avoiding contact with whatever - and in some cases, whoever! - brings on a phobic response in oneself, phobia management may also involve the necessity to cover up such reactions. After all, most of the time phobias define themselves by their irrationality, and few of us are keen own up to absurd fears. A case in point is my own deep-seated terror of nasty things lurking in the depths of the ocean; a fear that is fairly common, judging by the preponderance of films such as “Jaws”, “Orca”, “Deep Blue Sea”, “Open Water” etc. Please excuse me if I get the name of any of these films wrong; I'm sure that you will understand that apart from a brief (failed) attempt at aversion therapy with the “Jaws” trilogy I have never been able to bring myself to inflict these other cinematic offerings upon my fragile psyche. In my earlier, more rational days I sought to find some kind of explanation for my phobias. For a while, I blamed it on my childhood interest (consisting in equal measure of books fascination and terror) in the television series “Voyage to the Bottom of the Sea”. This featured a submarine whose crew continually encountered dangers such as giant squids and other beasts during their underwater voyages. Despite my revulsion, I could not bring myself to stop watching, so each episode was invariably experienced as a series of glimpses through my fingers when the most frightening bits were screened. This experience subsequently engendered a disproportionately negative reaction on my part a few years later. As a special treat, I had been taken to attend a live show in London featuring dolphins and whales, which performed a series of impressive tricks, jumping through hoops etc. Quite apart from the performance, I was awed by the bravery of the trainers who were in the water with these creatures! All went well until one of the trainers invited a few children from the audience, including myself, to change into swimsuits and "meet" with the performers. This alas sounded too similar to “eat” for my liking, at a time when I wasn't really old enough to fully appreciate the difference between dolphins, whales and sharks, and I made an embarrassing scene at the prospect of joining the beasts in the water! I found out a couple of decades later that my mother apparently shares my dislike of deep sea monsters, though I'm fairly certain that she was not the source of my fears in this regard. As anyone who knows her will testify, my mother does not suffer irrational foolishness well - not even in herself; hence I suspect she went to great lengths not to share her dislike of octopi and sharks with me when I was little. In fact, I never even found out about this phobia of hers until I was in my mid-20s, when I confessed my own, expecting to be soundly told off. Instead, she started laughing and told me that on a trip to the US many years ago, her hosts had taken her to visit the state-of-the-art aquarium (she was too polite to inform them that this was really not a treat for her!) and she soon found herself in trouble when she came face to face with the shark tank and realised that the flow of traffic in the multilevel aquarium only went one way; and she would therefore have to walk past the sharks to get to the next level. Needless to say, she managed it; and while I can honestly say I would not have been able to do the same, I would have expected no less of her. I have to say, on the occasions when I have shared this ridiculous shark phobia with my friends, they have been less than sympathetic. The most frequent response - particularly from those unfortunates who are scared of dogs or cats - goes along the lines of the following: "Yeah, well, you're not likely to meet many of those on the street, are you?!" 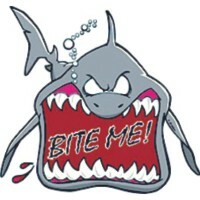 They have a point of course, but I want to assert that the frequency with which you come across shark attacks in the news, the movies, on television and in books indicates that my mother and I are not the only ones who are unhealthily preoccupied with these denizens of the deep. I used to think that those who were the most to be pitied with respect to such phobias are people with a fear of dogs. Let's face it, in the worst case, rats, cats or even cockroaches, another of my dislikes, can be dispatched - if not to their maker (since a trembling hand has misdirected many a well aimed shoe brought down on a roach), then at least away from one's immediate vicinity with relative ease. After all, as I have often been told about snakes - though I am yet to believe it - such creatures are likely to be more scared of you than you are of them. Dogs on the other hand are a different kettle of fish, if you will forgive the mixing of metaphors. For one thing, they can somewhat inconveniently sense your nervousness in their presence. For another, they can out-run and out-bite most of us without too much effort!